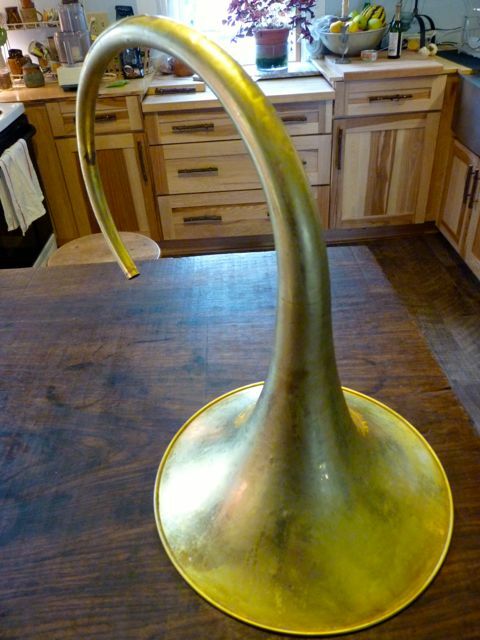 A couple of years a go a friend who owned a Korean War serial range 8D decided that she would like to convert her horn to a rose brass first branch and detachable bell tail. As a part of the cost for the work and parts I took the bell tail from her horn in exchange. 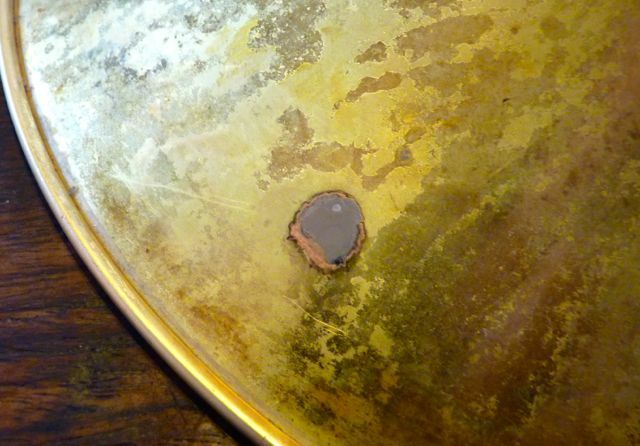 I knew it was brass because inside the bell flare where the hand rests had worn through the plating. We speculated that the bell was silver plated and used on her horn because Conn, at the moment of building the horn, had no NiSi bell tails. The rest of the horn appeared to be all NiSi. Recently we took a trip to Chicago to visit our son and I dropped off at Anderson Silver Plating in Elkhart this bell and two other silver plated horns to have the silver removed. Shortly there-after I received a call from Anderson’s that the work was finished and I could come and pickup the horns. It’s a bit of a drive to Elkhart, but I was listening to a good book on CD and the trip seemed like a way to save postage, and have a little road trip listening to a good book. As a note this 425XXX is of the era where brass was used heavily, note the valve casings and valve covers are brass and only the back bearing plate is nickel. 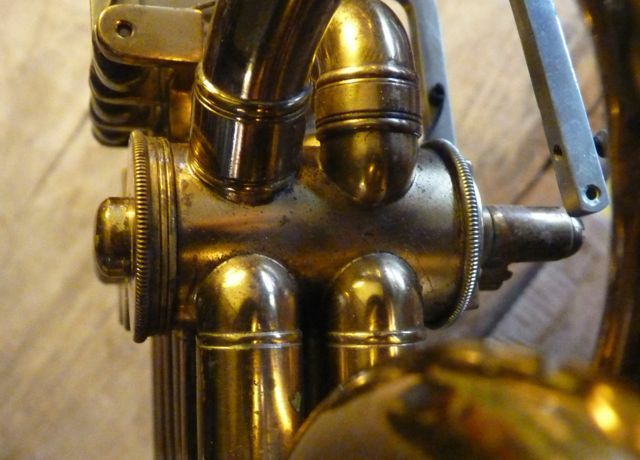 As I stated in the early posts on this blog, I wrote there are people who have forgotten more about the horn than I will ever know, If I’ve misrepresented facts in this blog, please speak up and correct me. We’ll all be interested in what you have to say…..
Only 28D I ever had must have been newer — L series serial number or some such. (Too bad I never made a note of the exact number.) All the NiSi parts were NiSi. Horn had been in a car crash. Newish tough-plastic Conn carrying case was ripped & bent, some of the hinges & clasps torn out. eBay seller I got it from must have been an insurance company or salvage broker, because he knew nothing about horns in general or that horn in particular. 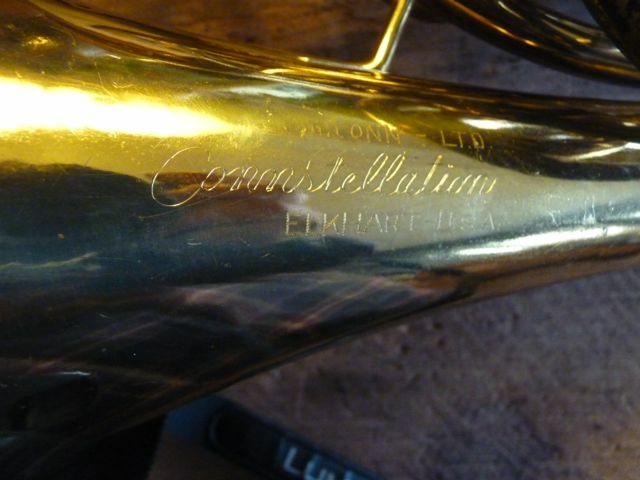 Seeing the Conn emblem on the case via eBay photos did not guarantee that the horn inside was also Conn, but the shots of the yellow brass instrument meant that if the horn was Conn, it was 28D (not 6D, with distinctive 6D wrap & front main tuning slide). When the wreckage was delivered, sure enough it was Conn (Elkhart) 28D. The original leadpipe had been replaced by a newish Conn 8D NiSi pipe. The valves had been replated & refitted, with oil ports added to the inner caps. I hope the insurance company paid the owner big bux for that loss, because the horn was valuable before the crash. I paid a modest repair bill to get the dents smoothed out locally. The finished product turned out great. Fortunately the damage only bent the horn & did not tear or sharply crease the metal. After repairs, the only telltale sign was some creasing in the lacquer on the widest expanse of the flare, no ripples or ridges in the metal itself. 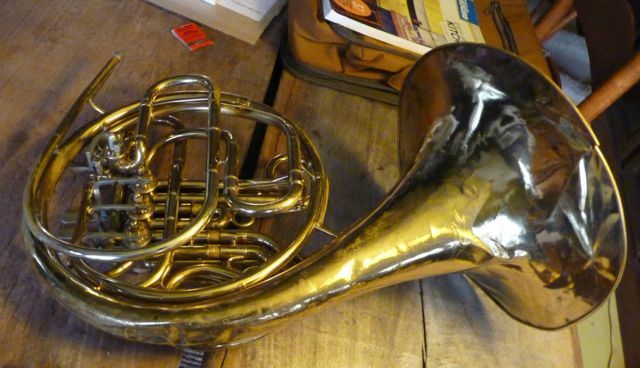 I housed the salvaged Elkhart 28D in an age-appropriate case that I had been keeping down in the basement & actually played the horn for a year or so before selling it off — to make room for more horns. 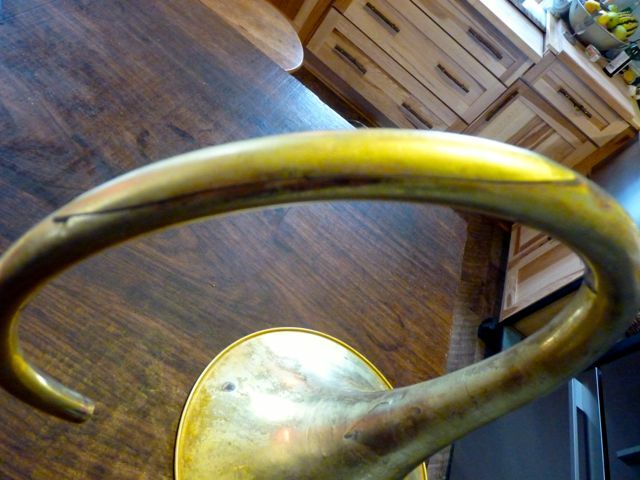 I kept the wrecked case — removed & re-used the handle on another horn case. Kept the remaining usable hinges, feet, & latches — already used 1 latch, 1 hinge, & all 4 rubber feet to fix other cases. Ripped out & saved the nice, clean foam-backed plush lining for possible use in upgrading some other horn case one day. Was going to throw out the bare ripped tough plastic shell, till the thought occurred that maybe I can cut off the widest parts & stick them onto 1 of those old F.E. 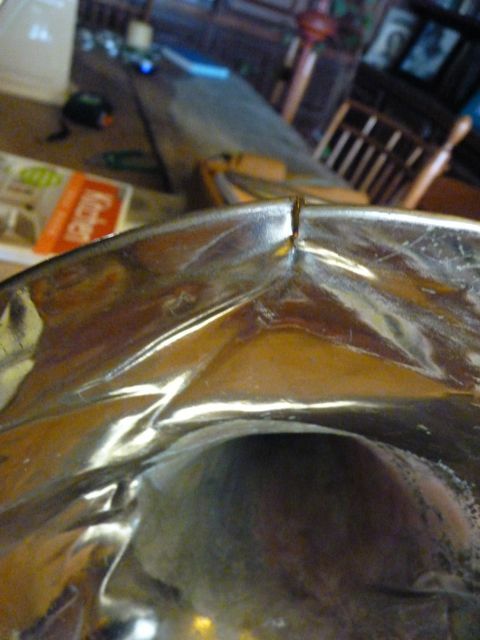 Olds horn cases that got brittle with age & started cracking & breaking right at the widest part. (May do that or may not, but if I do I’ll wait till I need to fix the Olds case — i.e., I won’t be doing it on spec.) 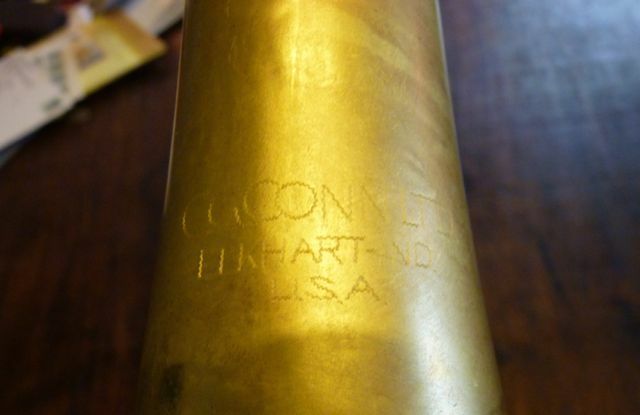 Now & then I get nostalgic about the salvage Conn (Elkhart) 28D. Then I get a grip & stay grateful that I’ve had so many outstanding horns over the years & still have several today. Is this a great country or what ?